We have pulled these resources together for the benefit of individuals just like you. If you are currently in the process of earning your driving privileges, you may find this information helpful. Educate yourself so that you can go into this process prepared and ready! ۝ Translates and notarizes necessary documents. ۝ Help (preparing) clients to get the correct credentials. ۝ Translate DL written knowledge and computer tests at SOS. ۝ Pick up and drop off the client from home to SOS and back & forth. ۝ Translates word-for-word the book "What Every Driver Must Know". ۝ Direct them on how to obtain a Temporary Instruction Permit (TIP). ۝ Refer Arab and Muslim community members to local driving schools. 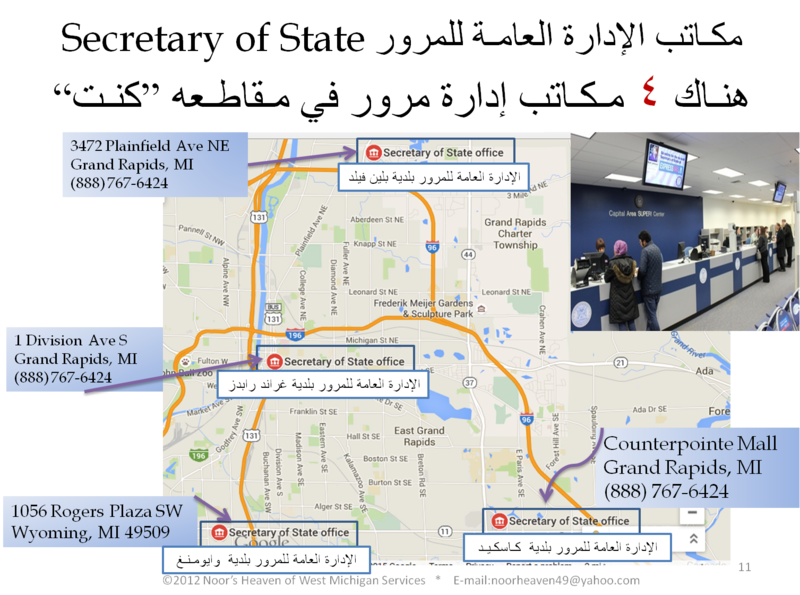 ۝ Offers workshops to raise awareness about traffic violations and Michigan's Point System. While we cannot provide any legal advice or answer any legal questions, we can refer you to a lawyer who may be able to assist you with your legal matter. Visit our "Traffic and Driving Violations مخالفات مرور ودفع غرامة"
Foreign government-issued passport or U.S. passport. Immigration and Naturalization Service Employment. 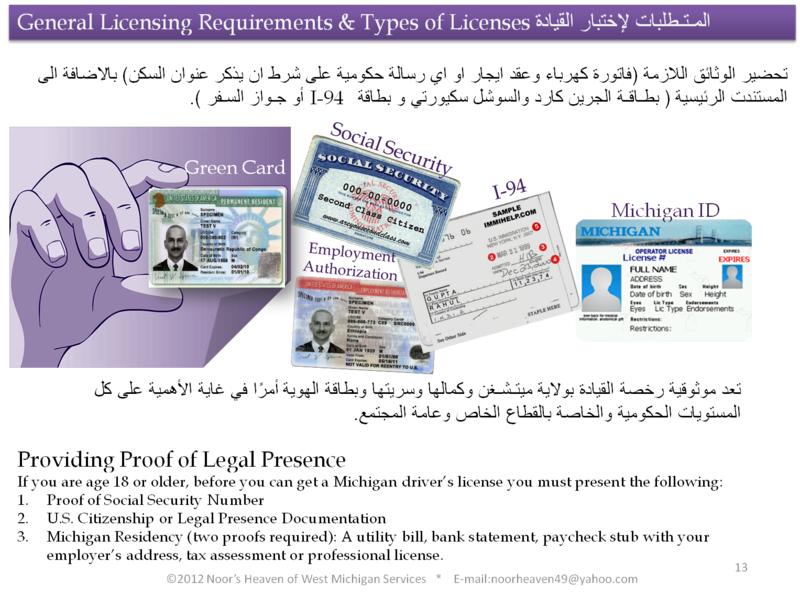 Provide two proofs of Michigan residency. Provide proof of Social Security number. The main drawback of the Real ID is that it gets scanned. ANYTHING that can be scanned CAN BE Hacked! So, as we now have to get these New Drivers Licences or as they are called Real IDs to be able to board a plane to fly within the United States, we will also be making ourselves more vulnerable to having our identities stolen! True Hackers are getting more sophisticated everyday. How many news reports have we seen about Target stores and other stores who got Hacked, and anyone who used their debit or credit cards at those stores were left vulnerable to that hack. These Real IDs are going to be no different. There will be an intelligent and sophisticated enough Hacker out there to create a program to steal our identities. And once ALL of someone's Real ID information is out there, and getting used, what do they do then? Don't think it can't happen, there are more chances it can, than can't. without the written knowledge test, TIP or Driving Skills Test.